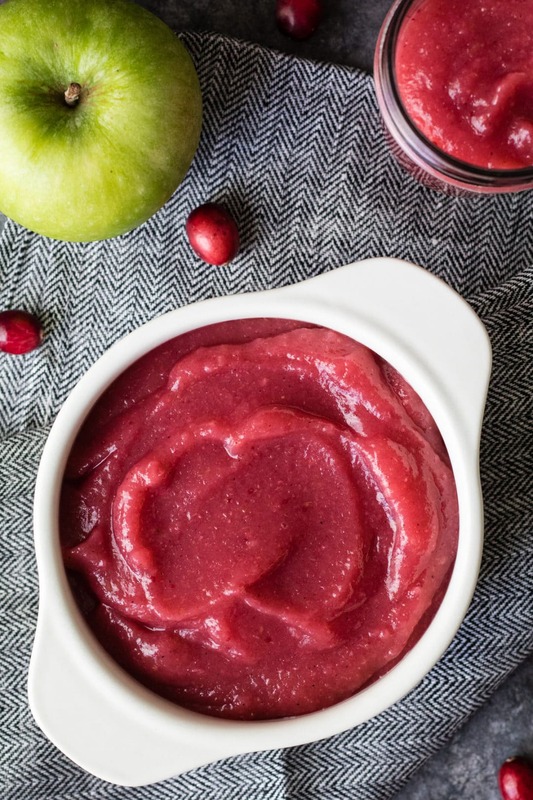 Cranberry applesauce is a fun way to enjoy applesauce during the holidays! This “cranapplesauce” will make your mouth water and your home smell divine! The only time I seem to cook with fresh cranberries is in November. But I want to change that because they are so amazing. It’s almost like every time I cook or bake with them I ask myself, “Why don’t I do this more often? !” From this cranberry applesauce to cranberry-ginger sauce and cranberry scones the possibilities are endless. I want to make it all!! Back to this cranberry applesauce though. Oh. my. god. I think I found Heaven on Earth. Not only is this cranberry applesauce beyond delicious…the fresh cranberries are very healthful for us too. Cranberries are loaded with phytonutrients which have antioxidant and antimicrobial benefits. Woo! I’ve made homemade applesauce two ways: chunky and pureed. I personally prefer to leave a few apple chunks in the applesauce however I have found the majority vote is smooth, pureed applesauce. After the apples and cranberries cook down for about 35-40 minutes, use an immersion blender to get the desired applesauce consistency. This applesauce is festive and makes for a great snack. Pair with a handful of almonds or cheese and you’ll be good to go. This cranberry applesauce is delicious warm (I microwave for ~15-20 seconds) or chilled. Let’s talk about the nutritional benefits of cranberries: A well-known benefit associated with cranberries is their ability to help maintain a healthy urinary tract and prevent UTIs. Beyond those benefits, cranberries also may help reduce inflammation in our bodies and help protect against cardiovascular health risks. Additionally, cranberries are rich in fiber and vitamin C. Using fresh cranberries – like in this recipe – can be somewhat intimidating at first. So, if you are buying dried or canned cranberries be mindful of the added sugars! It is all about how you consume fresh, frozen, or canned cranberries in your diet. Think beyond trail mix…try them with baked chicken, in wild rice or quinoa, or in your morning oats! Hope you enjoy this homemade cranberry applesauce! 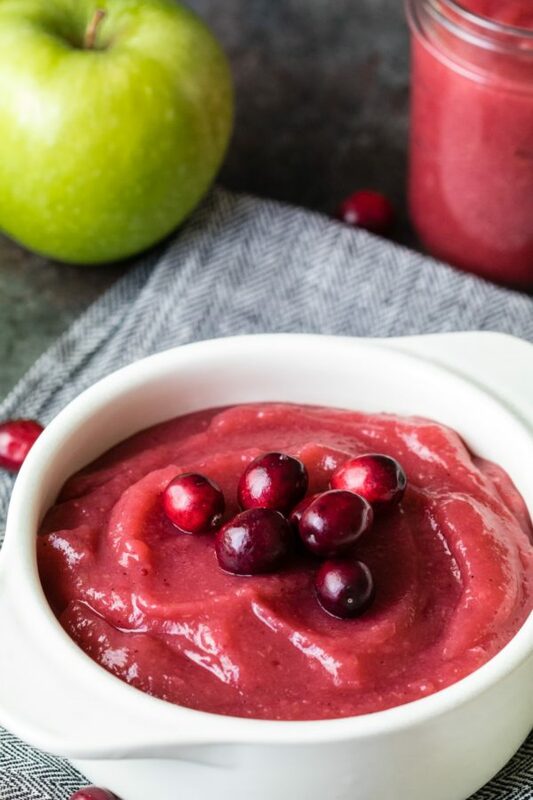 This ruby red cranberry applesauce is a festive way to enjoy applesauce during the holiday months! In a large sauce pan, cook all of the ingredients over medium-high heat from 20 minutes. Then continue to cook on low until apples get mushy and to the consistency you prefer. May use an immersion blender to get a pureed applesauce. Or, you can mash the applesauce with a potato masher! Serve warm or chilled. Keeps in fridge covered up for 5-7 days. I do the same thing! I never think to use cranberries outside of the holiday season but I need to change that! This looks delicious and I love the addition of apples. So much better than the canned stuff! Love this combo – cranberries add such a delight (and great holiday twist) to our typical dishes. I will definitely have to make some! Thank you so much Lauren! Enjoy! Love the combination of applesauce and cranberry sauce! I feel like I go cranberry crazy in November too! I bought some for the first time this season last week and have made 3 different dishes that contain cranberries. About to make that 4 different recipes with this one! I love applesauce and cranberries so this recipe is calling my name! Seriously! Thank you, hope you love it!